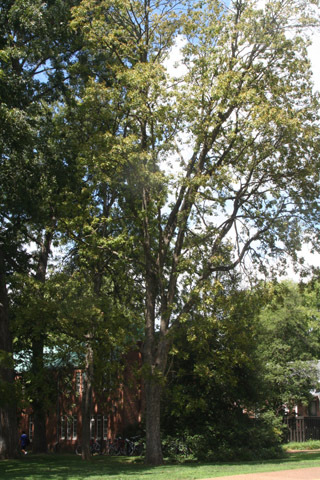 The Ohio buckeye in front of McTyeire Hall is noteworthy in that it was a former state champion tree of its species, and is mentioned on p. 50 of the Trees of Vanderbilt book. There are actually few Ohio buckeyes in the wild around Nashville, with most buckeyes in this area being yellow buckeyes. The leaves of the two species are similar - both have about five palmately (like the fingers on a hand) arranged leaflets. The most noticeable difference between the two species is the hull of the fruits. Ohio buckeye fruits have very spiny hulls, whereas the hulls of yellow buckeye are smooth. The common name of the species comes from the nut, which is similar in both species. This organism is a living specimen that is part of the  Vanderbilt University Arboretum  with the local identifier 4-474. Remarks: Former Tennessee state champion. Described in the 1994 Trees of Vanderbilt p. 50.